I have received word that the agency I refer to as “Dear Client,” Ecole USA, has no intention of ever paying their debts for translation services that have been rendered by numerous translators. If you are owed money (and I know many of you are based on the e-mails I have received) I suggest you file a police report for fraud against the following. If we can do it against Edith Trenou (aka Touareg) then we can do it against Ecole. My debt of $59.08 isn’t worth my taking any action (and frankly I feel I have gotten my money’s worth by writing about them in the blog). I plan on writing it off in April as a business loss. 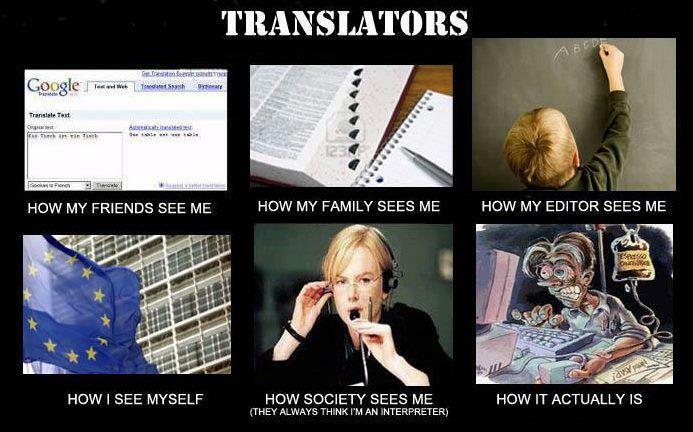 However, I know several translators are owed at least four figures. They used to operate under the name Ecole BA SRL in Argentina. The information provided on the website is old. I have been told they moved their offices and have not told anyone the new information. They have also offices in the U.S. (Houston), under another name, EGS or Ecole Global Solutions. I have it on good authority that they are using it from now on and pretending they are somebody else. The owners names are: DANIEL TOREA & CARLOS NACUZZI. They are responsible for all behind the scenes. The project manager CLAUDIA VOSS is the one who contacts the translators. There may be others working with them, because they allegedly hire and fire people all the time. The most frequent question I get asked when people find out I am a freelance translator is how I motivate myself to work instead of hanging out in front of the TV or doing any of the other numerous distractions we are faced with every day while working from home. I always tell them that my biggest motivator is my deadlines. It is what makes me wake up in the morning and gets me in front of my computer at a decent hour every day. My house is usually a wreck if I have a major deadline. That’s probably the main reason I am still single. 🙂 Oddly enough if I have a slow week I find I have less motivation to accomplish things. Adhering to deadlines is the most important quality a professional translator can have, which is why a recent job nearly had me tearing my hair out. I had accepted a large legal job that turned out to be a) more dense than I expected and b) contained one attachment that was extremely technical and outside my ability. The client had asked that I deliver 15,000 words of a rental agreement over a 5 day period. She contacted me on a Thursday afternoon and asked that I deliver the next Tuesday. After slogging through the dense legalese over the weekend I let the client know on Monday that I was running late and also asked if I could subcontract the last file (2,500 words) to a colleague who specializes in this kind of technical text. The colleague said this text was similar to other texts she had translated in the past and promised delivery by the end of the day on Wednesday. I finished my portion on Wednesday, and my colleague kept changing the delivery time. She ended up delivering on Thursday morning. Since meeting my deadlines is so important to me I was a nervous wreck by that point and had literally broken out in hives. My colleague is a wonderful translator and the final translation was wonderful, however the fact remains that it was late. The client had also asked me to translate another 3,000 words after delivering the first file (before the actual delivery of the first job), but since it was in the same technical vein she agreed that the colleague could do it. The colleague once again really botched the delivery (delivering on Monday afternoon instead of Friday as promised), and the client informed me she would never work with her again. I have a feeling the same applied to me, even though she insisted that wasn’t the case. Delivering on-time is a must for a freelance translator. If you can’t it calls into question your ability to translate the text. As my client commented, “In my experience, if someone is very slow they are usually struggling with the translation. Are you sure that she is competent with the content?” I assured her that she was competent. She just has problems with deadlines. As she herself stated, she allowed too many distractions. It didn’t help that I am friends with her on Facebook and saw her posts, which were not work-related. Needless to say I was not amused. I had known she had a problem with deadlines, so it is my own fault for thinking it would be different this time. I won’t let this affect our friendship, but I certainly can’t recommend her in the future. 1.) Care about the deadline. You have to be very serious about meeting them, and make them a priority. 4.) Make sure the deadline is realistic. There’s just 8 hours in a work day (give or take, depending your work environment) and you can only do so much. Don’t think of yourself as a robot. If you feel that your client thinks of you this way, talk to them about it, but in a professional manner. 6.) Avoid distractions. This means if you have work to do don’t start that book or plop down in front of the TV. If you need a break (and everyone does at some point), make sure the break is brief. 7.) One way to do this it to try the Pomodoro technique (I know it as the FlyLady technique) – set a timer and work intensely for a short amount of time (25 to 30 minutes) and then take a brief break (the key here is BRIEF) before starting the next timed interval. 9.) That said, once you have accepted a job, do everything you can to ensure you finish the job. This means pulling an all-nighter or working longer hours or on the weekend if you are running late. 10.) If you absolutely cannot make deadline (because you overcommitted, had a family emergency or your kid or dog got sick), you should contact your client and negotiate a second deadline. Don’t just drop off the face of the earth and stop answering e-mails and phone calls. Communication with the client is key. And whatever you do, make sure you meet the second deadline! I googled “Dear Client” today and clicked on the third hit, which was the ProZ Blue Board listing. I learned something very interesting while submitting my non-payment report to the Blue Board. Apparently, unbeknownst to me, I somehow became a paying member of ProZ in December 2011. This is news to me. I never authorized a payment to them. Consider me gobsmacked. They must be really desperate to inflate their member numbers if they are adding members without receiving payment from those said members. Anyone care to offer any insight because I would never knowingly become a paid member. Better late than never. I had a computer virus that has had me out of commission for the last week. I am finally able to check my mailing list e-mails and am catching up… Once again I am at a loss on an interesting topic to present, so if anyone has a suggestion I am all ears. The American Translators Association is now accepting presentation proposals for ATA’s 53rd Annual Conference in San Diego, California (October 24-27, 2012). More than 1,800 translators, interpreters, educators, language services companies, and project managers are expected to attend this year’s Conference. Making a presentation to such a diverse audience is an excellent strategy to gain widespread recognition as a leader and expert in your field. Speaking at an ATA Annual Conference is also a challenging and rewarding opportunity. A competitive peer-review process,with an emphasis on relevant topics in the translation and interpreting communities, is used to select presentations. The prestige of being accepted–as well as a discount on conference registration fees–is an unbeatable benefit of presenting. Submissions are invited from all areas of translation and interpreting, including finance, law, medicine, literature, media, science and technology, terminology, independent contracting, business management, and training/pedagogy. Sessions may be language specific or general. Click https://www.atanet.org/conferencesandseminars/proposal.php to learn more about the proposal process and to access the proposal form. The deadline for submitting a presentation proposal is March 12, 2012. Edith Trenou (a/k/a Edith Adjoke, Edith Adjoke-Trenou, Ameyo Edith, Ameyo Trenou, Edith Dackey, and Marie Edith Anna Rebecca Ameyo Dackey) doing business as Touareg, Touareg, Inc. (USA), and/or Touareg SARL (France) was booked at the Gwinnett County Detention Center on January 20th, 2012, on ten (10) felony counts of theft of services. Ms. Trenou was released on US$35,000 secure-bond bail and is under investigation by the Gwinnett County Police Department for theft of services. Ms. Trenou’s predatory practices have been documented since at least 2006 and have affected scores of T&I professionals. If you are performing or have performed any work for Ms. Trenou or her associates “Isabelle Vialette” or “Elodie Marias,” please get in touch with me at your earliest convenience. I can direct you to someone who can help. I don’t know who made this graphic, but it is making the rounds. I had to share it with you all, because it is simply brilliant. I needed the chuckle to start my day. Enjoy! Grant Hamilton shared this gem with the ATA Business Practices listserv this morning. It made me smile, so I wanted to share it. Q. How do you recover from a real proofreading blooper—the kind that has everyone in gales and is terribly embarrassing? A. Naturally, we have very little experience with this. Is there absolutely no way to blame it on someone else? If not, you probably should keep a low profile until it blows over. Lucky for you, proofreaders automatically have a fairly low profile.